Trout is a perfect fish for the grill and tastes great with a little smoke from wood. Whether you want to cook up individual fillets or the whole fish, it's a pretty simple process, and you can add a variety of flavors or experiment with different recipes. There are a few tricks that will help you create the perfect grilled trout and keep your fish from falling apart while it's cooking. When buying trout, you want to get a fish that is just the right size for the plate, about 6 to 8 inches long. This is true whether you are getting a whole fish or just the fillet. For trout fillets, it is good to get them a little bigger because they tend to hold together better. You also want to make sure the fish is fresh and clean. Look for shiny scales with firm, white flesh. The fish should be void of discoloration and dried edges. It may have a slight odor but it should not smell fishy. If buying whole fish, check to see if the eyes are nice and clear and not cloudy. Trout is a bit more delicate than other types of fish and it has a tendency to fall apart if it isn't handled carefully. However, it isn't too difficult to keep a fillet together while you are grilling. The first secret is to make sure your grilling surface is clean—foods stick to dirty surfaces, not the hot metal. Before you heat up the grill, be sure to clean the grate thoroughly and apply some oil to it. There are many grilling tools that you can buy, but when it comes to keeping your trout intact, what you really need is a carefully chosen spatula. If you enjoy grilling fish, a sizable spatula that is very thin will be a valuable addition to your backyard cooking toolkit. In order to keep the trout from falling apart, you need to keep it well supported when flipping, so a spatula that is large enough to pick up a whole fillet is necessary. The spatula should only touch the fish twice: once to flip it and another time to lift it off the grill. No poking, jostling, or playing around—that is what gets you in trouble. You can also use a grilling basket or fish basket to hold the fish together while you cook it. These work well and literally help you get a handle on your fish. The other secret is that trout should be grilled hot and fast. Get your grill as hot as it will go. Flip the fillet when the surface facing up changes color and then take it off the grill when the color change has reached the center of the meat. You can grill a fillet in about 8 minutes or less. A whole fish should take a little more than 12 minutes. Trout has a great natural flavor. When it's grilled, it is so good that you really don't need to add anything to it. Keep your seasonings simple and clean, with just a few light flavors like herbs, salt, and citrus fruits. If making fillets, a bit of olive oil, lemon juice, and salt is all you need. A sprinkling of fresh parsley at the end is the perfect finishing touch. The great advantage of grilling a whole trout is that you don’t have to worry too much about it falling apart and you can stuff the fish with all kinds of flavors. 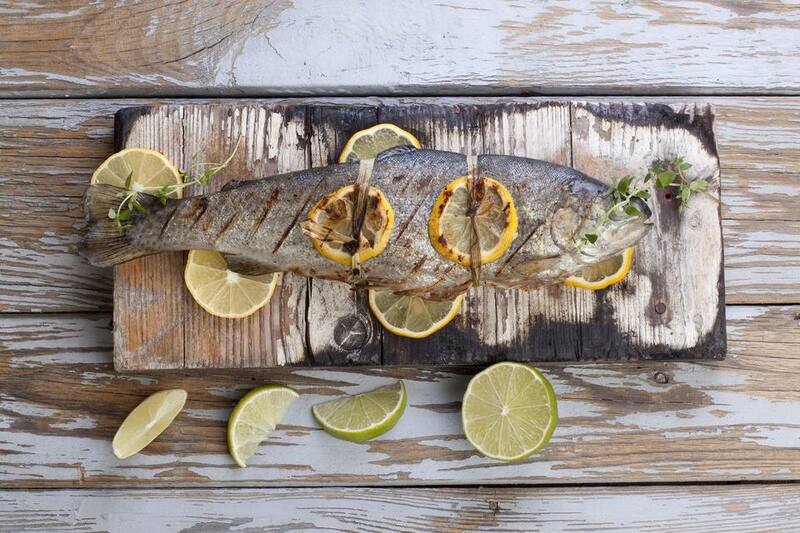 Pack a whole trout with lemon and lime slices, whole sprigs of rosemary, and cloves of garlic. Once the fish is cooked, the skin comes off easily and you can quickly pull the bones right out of the fish. If you're just getting started, you might feel a little better following a recipe, and there are plenty of them around that can serve as inspiration. For instance, try a campout trout recipe where you season a whole trout with salt, pepper, and thyme, and then wrap the fish with bacon. It works just as well for a fresh catch as it does for a whole trout from the store. Another popular option is to make cedar plank trout. This method eliminates the need to flip the fish, so there's no fear of it falling apart. The wood also imparts a nice flavor that enhances the trout's taste perfectly.